A long-necked extinct marine reptile, discovered fossilized with her developing embryo, marks the first evidence of live birth in the archosaur family, according to startling new research. The dinocephalosaurus achieved live birth some 245 million years ago during the Middle Triassic period, making it the only known member of the archosaur family to not lay eggs, according to a study published in Nature Communications. Today's birds and crocodiles along with extinct dinosaurs also make up the archosaur group. The discovery, which rethinks scientists understanding of the species’ reproductive system, was made when the fossil of a female dinocephalosaurus with the remains of a baby where her abdomen would have been was found in the Yunnan Province, southwest China. “Our discovery pushes back evidence of reproductive biology in the clade by roughly 50 million years, and shows that there is no fundamental reason that archosauromorphs could not achieve live birth,” the study stated. Dinocephalosaurus are odd looking ocean dwellers with an elongated neck, bearing a striking resemblance to the elusive Loch Ness monster. The baby Dinocephalosaurus, or what remained of it, was about a tenth of the mother's size, according to the research team led by Jun Liu of China's Hefei University of Technology prompting them to query if “the embryonic specimen (was) the last lunch of the mother, or its unborn baby,” Liu told AFP. "Upon closer inspection and searching the literature, I realized that something unusual has been discovered"—an embryo providing "clear evidence for live birth." The young Dinocephalosaurus was facing forward in the abdominal cavity, allowing scientists to dismiss the possibility it was prey as it would have been swallowed head first. 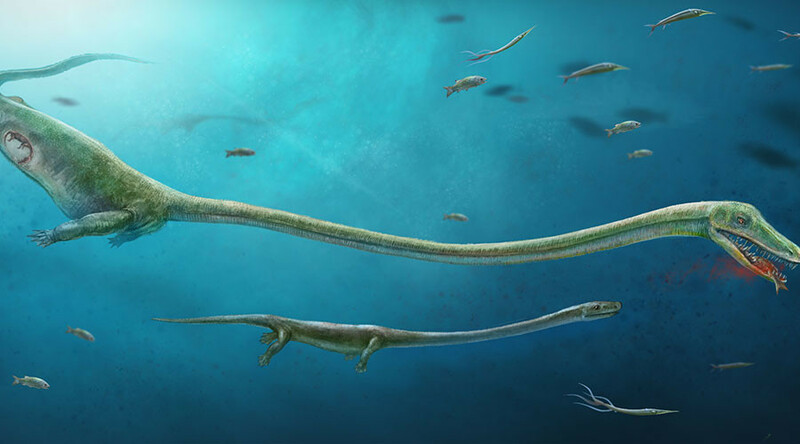 The team also factored in the possibility that the tiny reptile had been inside an egg shell which simply eroded over time but concluded this was unlikely as there were no shell bits found and the creature "demonstrates the curled posture typical for vertebrate embryos." Liu also noted that archosaurs tend to lay their eggs at a much earlier developmental stage.